Only 75 percent of authorized funds have been awarded since Congress created the drought-warning program seven years ago, and future funding remains unclear as NIDIS prepares for Capitol Hill on Thursday. 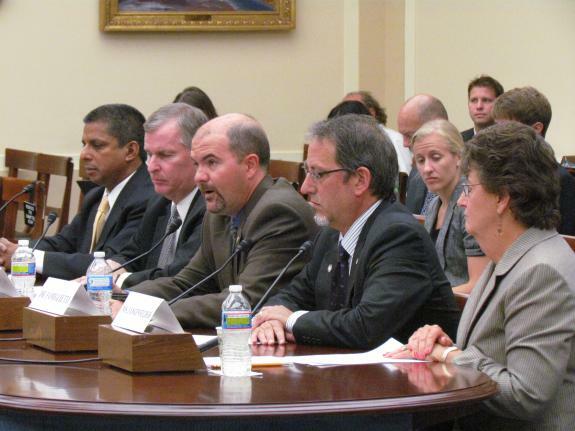 A panel of water specialists testified before the House Science Committee on July 25, 2012, about the role that the National Integrated Drought Information System (NIDIS) plays in preparing the country for drought. NIDIS’s director Roger Pulwarty is seated at the far left. Click image to enlarge. Since last year, an intense and widespread drought in the United States has pummeled farm production, halted shipping along the Mississippi River, and caused some of the Great Lakes to drop to record lows — and climate forecasts show this trend is likely to continue into the 2013 summer. But because of budget cuts and the uncertainty from not even passing a budget for fiscal year 2013, the U.S. government is hindering the ability of its own science agencies to collect the basic information used by the National Integrated Drought Information System (NIDIS), a federal warning system that predicts and responds to drought. Instead, Congress is chipping away at the program’s foundation — the hydrological data on snowpack and river flows that makes drought analysis possible — at the same time that legislators are clamoring for systems that better prepare the nation for climate change. Both NIDIS and its companion, the U.S. Drought Monitor, help the nation respond to drought. Whereas NIDIS focuses on the forecasts, research, and data dissemination that states use to manage the social and economic effects of drought, the Drought Monitor is a state-federal partnership that provides a weekly snapshot of hydrological conditions. Led by the National Drought Mitigation Center at the University of Nebraska, Lincoln, the Drought Monitor, a voluntary service that has no funding, is also the basis for federal drought disaster declarations. Willardson is not alone. Water managers and environmental groups across the country rely on NIDIS, which is overseen by the National Oceanic and Atmospheric Administration (NOAA), for climate and river forecasts. Even the most recent National Climate Assessment, a draft of which was released in January, stated that adaptation to climate change would require better coordination between local, state, tribal, and federal partners, which is one of NIDIS’s central goals. Yet, despite that NIDIS is such a vital asset, only 75 percent of the total money authorized for the program — created by Congress in 2006 — has been allocated. Furthermore, the program’s founding legislation expired during the last session of Congress without being reauthorized. On Capitol Hill in Washington, D.C., this Thursday, NIDIS and the National Drought Mitigation Center will discuss with lawmakers and the public what to expect for water supply, wildfires, and weather conditions in 2013. The meeting will take place in the offices of the House Science Committee, which created NIDIS seven years ago. It is the same committee that will set funding levels for the program’s next phase, a legislative matter that the committee will likely take up again this session. First, the failure of Congress to pass a budget last year left several science agencies in a planning lurch. These agencies contribute most of the data for NIDIS. Just like business leaders who complain that the fiscal monkey business in Congress — the temporary tax measures, the fiscal cliff, the across-the-board budget cuts due March 1 — does not give them a stable operating environment, the heads of federal programs that collect hydrological data are flummoxed by the political theater, as well. “It’s strange — I can’t even tell you what our budget is right now. We don’t know,” Pixie Hamilton told Circle of Blue. She is the national coordinator of the Cooperation Water Program, a branch of the U.S. Geological Survey that monitors river flows, water quality, and groundwater levels. Oddly enough, the program is benefiting, at least temporarily, from the budget impasse. President Barack Obama’s 2013 budget proposal would have cut funding to the program by $US 5 million, which would have put about 8 percent of its monitoring stations — 1,300 sites in all — at risk of elimination. * But since no budget was passed, the cuts have not yet come. Outright funding cuts like these, however, are the second source of concern for NIDIS. For instance, the National Water and Climate Center in Portland, Oregon, is enduring both the fiscal uncertainty and the funding cuts. “The uncertainty is very difficult. It puts us in a situation where we have difficulty filling vacancies — we have a large number left open,” Michael Strobel told Circle of Blue. He is director of the National Water and Climate Center, whose budget was cut by 15 percent in 2011 and remained at that level last year. The center, which is responsible for water supply forecasts in the Western United States, let its member states determine where the cuts will be made. Some states have deferred maintenance on their monitoring stations. Montana is the first to eliminate stations altogether, discontinuing 39 low-priority sites. Eliminating monitoring stations, like in Montana, is an act of last resort. The data gaps that result from discontinued stations make assessing long-term trends difficult. Just last week, the U.S. Government Accountability Office (GAO), an internal watchdog, said that gaps in data from weather satellites pose a high-risk to the federal government’s ability to make accurate weather forecasts. Roger Pulwarty, the director of NIDIS, is circumspect when asked if his program has enough financial support. As appreciative as Pulwarty is of NIDIS’s mere existence, others outside of government make the case that Congress could spend more on data collection. Willardson noted that the Western states do not have nearly as much information on water use as they would like. And a look at the budget history for NIDIS justifies this view — the money that Congress allocated to the program since 2007 is 25 percent less than what it authorized. Representative Ralph Hall (R-Texas) sponsored the legislation that created NIDIS, and he introduced a bill during the last session of Congress that would have reauthorized the program. Hall would not speak with Circle of Blue, but his communications director said that he still supports the program. NOAA’s 2013 budget request asked for a 12 percent increase to NIDIS so that the program could expand its drought early-warning system. Hall’s reauthorization bill would have set NIDIS funding at this higher level, but it was not enacted and will need to be reintroduced. The strength of NIDIS, according to the people and organizations who use it, is the program’s emphasis on collaboration and information that is locally relevant. NIDIS has developed drought early warning systems for four regions: California, the Upper Colorado River Basin, the Four Corners Region, and the Apalachicola-Chattahoochee-Flint River Basin in the Southeast. These are the only regions in which NIDIS collaborates directly with basin stakeholders, but Pulwarty would like to expand the program. “To have an adequate early warning system, the U.S. needs to have the best monitoring available,” Pulwarty said. “NIDIS’s information has been important and helpful, given the drought conditions in the [Apalachicola] Bay,” said Dan Tonsmeire, executive director of Apalachicola Riverkeeper, a group that works to protect both the river and the bay. Tonsmeire told Circle of Blue that the call gives water users in the ACF Basin an idea of what the management plan will be for the upcoming weeks. Collaborations like these are essential for NIDIS to function and are essential for data collection, in general. For example, Willardson told Circle of Blue that NASA almost left out a thermal sensor on its latest Landsat mission, because the space agency did not think anyone used the data. But Western states — particularly Idaho — have used the satellite data to track evaporation from farm fields and to settle claims for water rights. That satellite mission is safely off the ground, having launched last week. But with a March 1 deadline for a budget deal before $US 1.2 trillion in automatic, government-wide spending cuts kicks in, science agencies are preparing for the worst. “Even a small change in the budget can have a major effect on how we operate,” Strobel said. *Note: At least one monitoring programs, the National Streamflow Information Program, would have seen a slight increase in funding under the president’s proposed budget. An excellent and timely article… regretfully the budget situation is in lockdown… What are somethings that NGOs and local organizations can do in your opinion?